We have finished bringing in the harvest on our farms. The work we are doing now is the threshing of sorghum and millet, which are the most important cereals we grow. After the harvest we collect the ears of sorghum together on the farms to be dried. We protect them from the animals that can now wander freely in and out of the village. Because these animals are free to roam around we cover the ears of cereals with thorny branches. The branches grow on a species of tree we can find everywhere in and around the village. We keep the ears drying on the farm for two or three weeks. After this period they will be dry enough to be threshed. Then men clear a patch of ground, removing any grasses and other bushes. On these cleaner areas they spread the ears of cereals. Threshing is exclusively a work dedicated to men. They form a line and thresh the ears of cereal with long sticks (the flails) going to and fro from one edge to another of the threshing ground. This the way we thresh sorghum, millet and fonio. Maize is processed in another way. In the past we used to remove its grains with our bare hands and a knife. But nowadays most of the farmers in my village use a machine to thresh their maize. 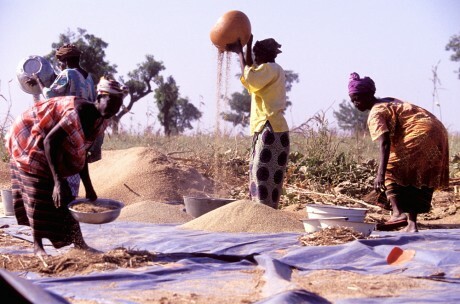 After men thresh the ears of sorghum or millet women finish the work. We separate the grains from the chaff. We fill large vessels with the crushed ears of cereal and pour the contents from one vessel to another. As the grains pour the wind carries off the chaff. Wind is very important for that part of the work. If there is not enough wind you may have difficulty separating the grains from the chaff. As the threshing is ongoing I cannot assess the yield of our farms this year. But I think that we will reach the rate of last year. The farmers could greatly improve the yield of their farms if they had modern tools. I’d like to get a tractor, but I don’t have enough money to purchase such a machine. I cannot also get credit from a bank. There are two tractors in my village that so many farmers want to hire to plough their fields. If I had one I would enlarge my family’s farms and make much more money because the other farmers would hire it.